With a whirlwind of activities, I haven’t had a chance to edit photos and share this week’s worth of inspiration. 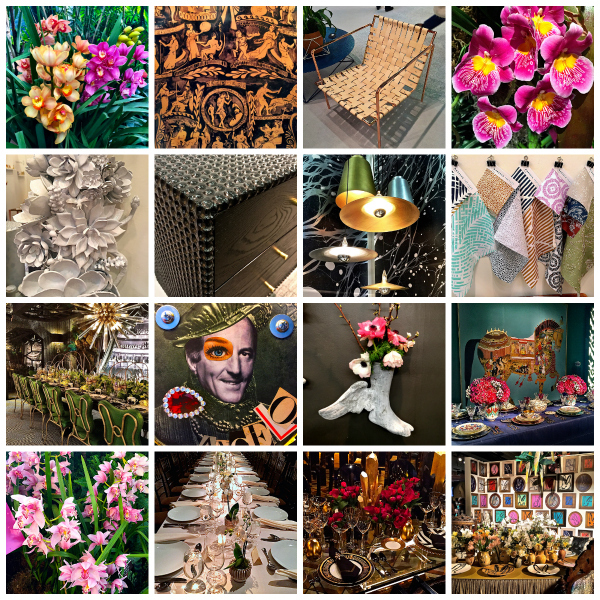 Between a special evening at New York Botanical Garden’s Orchid Show, the Architectural Digest Home Design Show and the DIFFA Dining by Design tables, my camera is full and my feet exhausted. So here is a little preview of what’s to come. And don’t forget to check back on Monday for an exciting new episode of our video series. This entry posted in art, furniture, garden, interior design. Entry Tags: Architectural Digest Home Design Show, DIFFA Dining by Design, Flowers, Gardens, interior design, New York Botanical Garden Orchid Show Bookmark the permalink. Stacey you have had an incredible week and the images that I have seen from the DIFFA event just blow me away, so stunning! I am so looking forward to the next video! Wow! What a week for you, can’t wait to see more next week. What a colorful way to celebrate spring on a snowy day! Sounds like you need to put your feet up and be pampered this weekend. Colorful selection! This mix between dining table centre pieces and flowers match so well! I have had this post in my inbox for almost a year because I have a question for you. I love the collage or box formation of the photos above. Can you tell me what you used to design this? I would love to do something like this on my blog. 79 queries in 0.409 seconds.